In what was a fast-paced day of science and celebration, both Kim Clarke and Shalini Saxena defended their dissertations last Monday. Kim’s talk (The Fabrication and Study of Stimuli-Responsive Microgel-Based Modular Assemblies) focused on controlling the properties of responsive thin films composed of microgels by spatially separating the assembly-controlling functionalities from the responsive elements via core-shell synthesis. She also presented some nice stuff on the modular assembly of peptides onto microgels as a means to control microgel surface functionality via non-covalent approaches. 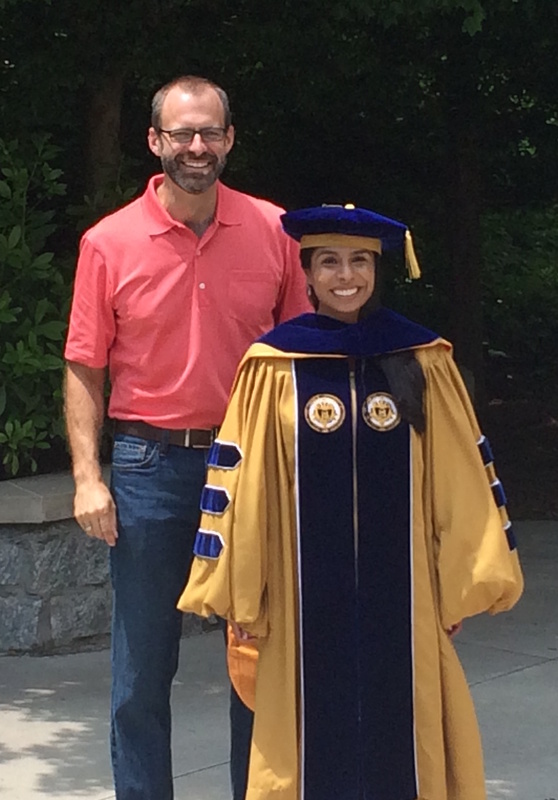 Shalini’s talk (Development and Characterization of Tunable Hydrogel Nanoparticle Assemblies) detailed her investigations into “raspberry-like particles” composed of dense (e.g. silica, polystyrene) cores with microgel shells. 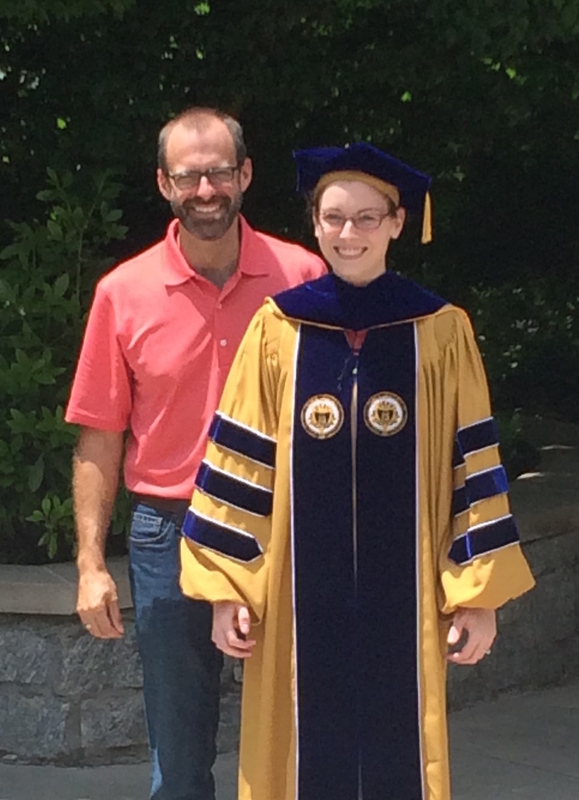 Through a series of clever approaches, she has been able to construct fairly complex 3-component aggregates, which form through a delicate interplay of microgel adhesion forces and mechanical properties. These heteroaggregates are of potential interest as drug delivery vehicles. The second part of her talk described new approaches for the rapid fabrication and patterning of microgel-based films with tunable mechanical properties. Preliminary studies suggest that such materials are of potential use as biointerfaces to direct cell proliferation. 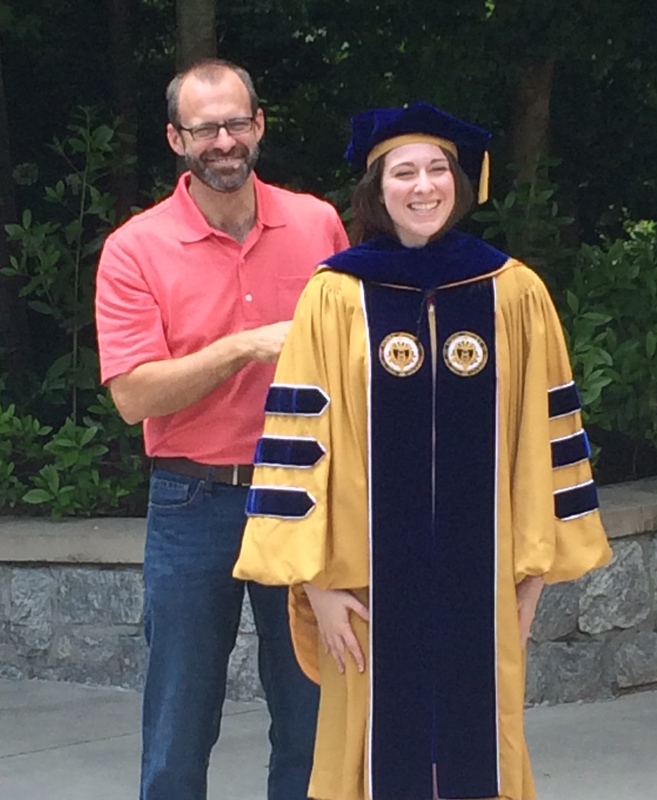 Since I wasn’t able to get back into town for graduation, we stepped outside for some post-facto hooding (pix below), including an appearance by Emily, who you will recall defended earlier in the semester. Congrats to all three grads!